It’s not that we don’t love NFL Sundays, Friday Night Lights or Big Monday in College Basketball, it’s just that College Football is, well, unlike anything else. From rivalries to traditions to the any-given-Saturday possibilities. It’s just special. All around the country, our traditions and ideals are so different, but we all have one thing in common: a mutual love for NCAA football. On weekdays, most of America wakes up, gets coffee and heads to an office. On Saturdays, most of America wakes up to Lee Corso and the College Gameday crew at our nation’s top site for college football that week. From “Jump Around” to “Sweet Home Alabama”, we’re zoned in on our mutual affection for the university we grew up loving, attended, or watched record-breaking performances by our favorite players occur at. But why? Because Appalachian State beat Michigan. Because of the Kick 6 in the Iron Bowl. Because of Hail Flutie. Because anything can happen. 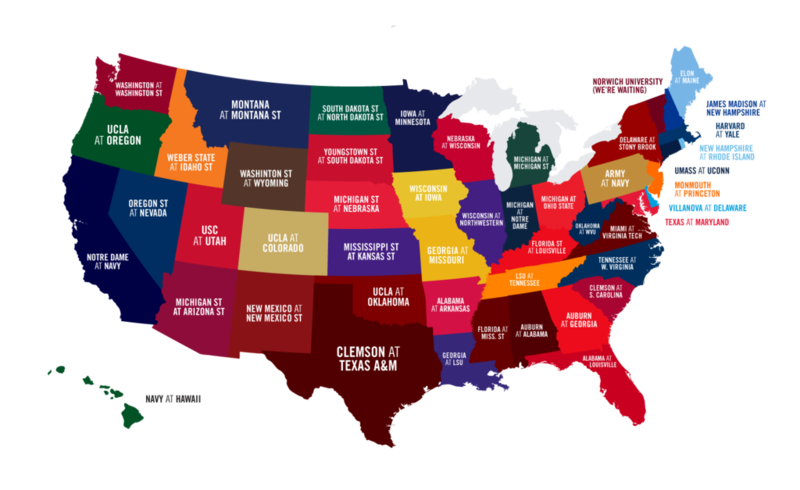 Because we are, the United States of College Football. With 175 DAYS UNTIL COLLEGE FOOTBALL SEASON, there are SO many intriguing games on the 2018 college football slate. Organized below, you can see the top game by state. The information below is based off of demand for tickets to the game, the average ticket price to attend the game and historical data on what consumers previously paid to see their teams. Based on average ticket prices, these were the top 10 regular season games from the 2017 college football season. As we look ahead, here are the games we’re most excited for! Clemson at Texas A&M – September 8, 2018: These two have only played four times EVER, and this will be the first time since 2005. Additionally, average order value in 2017 for Clemson was $590, while Texas A&M’s average was $373. The Tigers currently look like they will go into the 2018 season as No. 1 in the preseason poll, returning quarterback Kelly Bryant and most of their defense that ranked as one of the best in the country. Meanwhile, the Aggies signed head coach Jimbo Fisher away from Florida State on the largest contract in college football history. Texas A&M will have bigger expectations than ever. Auburn at Georgia – November 10, 2018: Auburn handed Georgia their only regular season loss of 2017, but the the Bulldogs ran wild on the Tigers in the SEC Championship to advance to the College Football Playoff. “Between the Hedges” is one of the more underrated rivalries in college football, and with Georgia announcing its arrival as a power last season, this rivalry has new stakes. Both teams were also in the top 12 in average ticket price last season, with Auburn at $234.69 and Georgia at $145.02. Auburn vs. Washington (Chick-fil-A Kickoff, Mercedes-Benz Stadium in Atlanta, Georgia) – September 1, 2018: Playing each other for the first time in football, Washington will also be the first Pac-12 team to participate in the Chick-fil-A Kickoff, while Auburn will play at Mercedes-Benz Stadium for the THIRD consecutive game (vs. Georgia in the 2017 SEC Championship, vs. UCF in the 2018 Chick-fil-A Peach Bowl). In the last two years, each team has also been controversially left out of the College Football Playoff. With star quarterbacks Jarrett Stidham (Auburn) and Jake Browning (Washington) returning, there could be some fireworks on opening night. The Tigers ranked fifth in 2017 average ticket price, while the Huskies came in ninth. Florida at Mississippi State – September 29, 2018: Nearly a decade after leaving his offensive coordinator post at Florida to become head coach at Mississippi State, Dan Mullen returns to the swamp to head the Gators. Even better, he’ll return to Starkville in his first season with Florida in a cross-division matchup in SEC play. Mississippi State’s selection of Joe Moorhead as Mullen’s replacement is also intriguing, as he ran an offense similar to Mullen’s as Penn State’s offensive coordinator for the past two seasons. The Bulldogs return quite a few underclassmen starters, so this could be an early statement game for Moorhead. Florida’s average order size in 2017 was $379.16 and Mississippi State’s was $238.92. UCLA at Oregon – November 3, 2018: Since Chip Kelly left Oregon to take his talents to the NFL, he and the Ducks have combined for six coaching changes in five short years (Philadelphia Eagles, San Francisco 49ers and UCLA for Kelly; Mark Helfrich, Willie Taggart and Mario Cristobal for Oregon). Everyone is excited as Kelly returns his spread offense to college football. Meanwhile, Cristobal – whose only previous head-coaching experience was at FIU from 2007-2012 – takes over for Taggart, who left South Florida for Oregon before relocating back to Florida this offseason because of Florida State’s unexpected coaching opening. Kelly will have to replace soon-to-be NFL first-round pick Josh Rosen at quarterback first and foremost. In 2017, the average order size for the Ducks was $424.23 while the average for UCLA was $210.77. Michigan at Notre Dame – September 1, 2018: A rivalry renewed. Since Jim Harbaugh’s entrance as Michigan’s head coach in 2014, the Wolverines have not faced Notre Dame due to the Fighting Irish’s scheduling commitments to the ACC. However, Harbaugh and Notre Dame’s Brian Kelly worked with their respective athletic directors to get the series back on track, and a home-and-home has been scheduled for 2018 and 2019, with progress being made toward extending the series further. Six of the top 12 games in 2017 in average ticket price involved these two teams, and they finished 1-2 in average ticket price ($259.37 for Notre Dame, $258.81 for Michigan). Ohio State vs. TCU (AT&T Stadium in Arlington, Texas) – September 15, 2018: Facing each other for the first time since 1973, Ohio State takes on TCU at the same place the Buckeyes won the first-ever College Football Playoff Championship. The teams had a home-and-home scheduled for the next couple seasons, but scrapped that for the bright lights of Jerry World. The intrigue here lies within the quarterback position. Ohio State’s next QB will have enormous shoes to fill, as J.T. Barrett leaves an all-time great legacy on the program, and Big Ten Conference. Meanwhile, the Horned Frogs will look to replace Kenny Hill, who left Texas A&M after one up-and-down season and rebuilt his reputation as a leader in Fort Worth. The Buckeyes ranked fourth in average order value in 2017 at $610.21, while the Horned Frogs were 25th at $316.71. USC at Texas – September 15, 2018: Unfortunately, we won’t get an encore to last year’s quarterback duel between USC’s Sam Darnold and Texas’s Sam Ehlinger because Darnold entered his name for April’s NFL Draft. Ehlinger, despite making “rookie mistakes” in the game, showed tons of grit in leading the Longhorns back from a big deficit and appears to have a bright future. Meanwhile, J.T. Daniels, who was the top quarterback in the 2019 recruiting class before re-classifying to 2018, is expected to be the starter at some point next season for the Trojans, if not from Day 1. Texas was 10th in average ticket price last year at $166.49 and USC was 21st at $119.57. Georgia at LSU – October 13, 2018: A rarity for Georgia, who is regularly criticized for not having to face Alabama or LSU in SEC play. For just the second time since 2010, the Bulldogs will face the Tigers in the regular season. While Georgia is coming off a College Football Playoff appearance, LSU ended 2017 strong with a bowl win, but will have to replace key pieces on both offense and defense. Both schools were in the top 20 in average order value with LSU at $387.48 and Georgia at $344.85. Michigan at Ohio State – November 24, 2018: As much as we tried to stay away from obvious rivalries, it’s hard to ignore the fact that Ohio State will be without Barrett – who went 4-0 against Michigan – for the first time against Harbaugh. While Dwayne Haskins replaced an injured Barrett in 2017’s game and led the Buckeyes to victory, we have yet to see what a season’s worth of wear and tear will have on him. Meanwhile, the Wolverines will likely have an open QB competition in the spring to find out who their starter will be. Brandon Peters played well when healthy in 2017 and former top recruit Dylan McCaffrey redshirted, but Ole Miss transfer Shea Patterson will also enter the picture. What has been a weakness for Harbaugh may soon become a spoil of riches. Also, these teams ranked 2 (Michigan, $258.81) and 3 (Ohio State, $242.50) in average ticket price in 2017. If you have any questions, please contact us at hello@ticketcity.com.